Jaipur is one of the famous tourist destinations of Rajasthan. Founded in 1727 by Sawai Jai Singh,a Kachhawaha clan ruler, Jaipur is the capital city of Rajasthan. Originally it was known as Sawai Jaipur ,after the name of its founder. Jaipur city is a true example of perfect harmony between the traditional and the contemporary. It is also a halt for the tourists heading for other cities like Jodhpur and Jaisalmer. The city is developing at a fast pace as the government and the private sector has taken up several development projects. 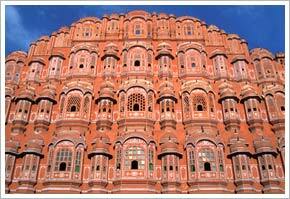 Popularly known as the Pink City, Jaipur was once the royal abode of the erstwhile Maharajas. It still holds its old-world charm. It has rich history and culture. It is world wide famous for its rich and royal heritage such as Lake Palace, Hawa Mahal, Jantar Mantar, Elephant festival, Nahargarh Fort and Sisodia Rani Ka Bagh etc. Jaipur is a part of the Golden Triangle of India and hence very popular with tourists. One peculiarity about Jaipur is that it was constructed in accord with Vaastu Shastra(Hindu architectural principles). Majority of the buildings of the city are painted in pink color. The traditional Hindu and the Mughal form of architectural style has been used in the city. The people of Jaipur are full of life and they celebrate their fairs and festivals with great fervor. Elephant festival and International Kite festival are the famous ones. The bazaars(market) of the pink city are stocked with beautiful handicrafts semi precious stones. Jaipur is well connected with all the major cities such as Delhi,Jodhpur, Kolkota, Udaipur and Mumbai through airlines and railways. Jaipur goes through all the four seasons Winter,summer,spring and autumn. It is hot in summers and cold in winters. The best time to travel to Jaipur is from October to March. The climate remains pleasant during this period.